Great location terrible accommodation we are just back from a week of misery,apts are very very basic to say the least, but no heating in December and January you can't imagine how cold it was we hired a 2bar heater for sitting room and moved bedding into here still had to sleep with cloths on ,that's when we could sleep for all the noise.when we complained we were told nothing could be done this was just normal .please please do your selves a favour do not stay in these apts . my partner,my friend and his wife have visited this establishment on four occasions within the last twelve months. during that time,things have gone from bad to worse,the rooms need a complete overhaul,and whilst the rooms are very basic(no washing machine sighted by me in any of the rooms,despite advertising literature on the web)there is no way that we shall be returning to these apartments.the staff are very courteous,but there is just so much wrong with the place. the clientele seems to be more like a club 18-30 group,and weekends are just awful with stag and hen parties staying there,giving no though or respect for other people,returning drunk and causing mayhem. the security is non existant,and do not rely on the double mortice lock on the apartments doors.my friend and his wife returned to find they had been broken into,by a well placed kick to the door and had property stolen.anyone can enter thee premises without fear of being stopped and checked.Whats a good point about the place ?. they have got a new lift ! other than that,unless you want a to join in the mayhem,my advice is to find somewhere else to stay.the place has gone to the dogs,which is a shame. We just come back from 2 weeks holiday in the Sunsea 2 apartments which is now called the Maryciel apartments.0 Not so good. Stopped in these apartments 3 years ago and they were very good, clean bedding and towels changed every few days. There was a security man on every night and you felt safe and now after five o'clock there's no security or staff on at all. There were gangs of lads and lasses shouting most of nights running up and down stairs, partying people coming in and out of apartment what wasn't even staying at the apartments. Pool wasn't cleaned out enough, gipsy coming in using pool. Worst holiday ever. These apartments have gone down hill in three years and it's a shame as it's in a brilliant location. This hotel was booked on the confidence of a certain tour operator who explained she'd stayed there and had a "great time". A group of twelve eighteen year old lads looking for a fun holiday with a little security too. when we arrived (two hours before check in) we were told we could leave our bags in a small room which could only have been 5" by 5" and to come back later, how much later?? When we returned we were advised our room was "ready" a huge apartment with 3 balconies on the 21st floor. The room was far from ready with maids (not in uniform) scrambling round to make good of the situation they were in, great views, huge apartment but awful standard of cleanliness, cockroaches visible and running round the broken tiled floor at regular intervals during the day!! The steps up to the sun sea three are very steep even for young fit lads and we found on exit and return to the hotel we were bombarded with bottles of urine, empty beer bottles and a number of other items from the hotels overlooking the steps and pool area. Looking back if it wasn't for the fact we were young and had "lower standards of living" in 2001 we probably would have walked. £350 per person for a week in a hole like this was money not well spent. We look back now and recall the hotel from hell. Please be advised for young folks who just want somewhere to lay their head and shower and change this would be as good as the local youth hostel. For any others thinking of staying here. Please don’t it will be a bad memory. Oh and do beware the over keen security guards who operate after nine and do not take kindly to any form of friendly light hearted banter and did follow us up to our room and wait in the corridor for two hours making us feel genuinely frightened and worried. I understand that some holiday makers don't give the best representation of Brits abroad but we felt we were victimised and tarred with the same brush as many who go to make trouble and cause havoc which we did not. Sunsea 111 is very basic, though clean. The location and views are really good, although 'Cardiac hill' is quite a climb. the apartment ie punch holes in the doors!!!!!!!! We then opened the curtains and the view took our breath away. Some of the staff are not very friendly, but one lady in particular (blond) was really nice. The pool was clean and tidy. There was some noise from other residents but that only happened a couple of times. We will go back because of the location and the views, I would like better facilities in the kitchen next time. We`ve just returned from 2 weeks at the Sunsea 111 apts. Benidorm, and Boy! are we glad to be home!! The Sunsea 111 apts have ONE decent feature & thats the size. 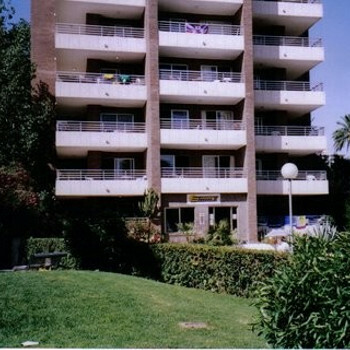 Very, very large with 2 bedrooms/2 bathrooms and 3 balconies with beautiful sea views. That's where the good points end!. The apts. are very shabby, dirty and dated. The maid service is indifferent (clean towels thrown in ONCE in a fortnight. Kitchen equipment is virtually non-existent (as are toilet rolls). The complex has NO on-site facilities e.g. snack bar, waiting room or chairs for your last day and NO courtesy room. The staff are uninterested and the worst thing (for me anyway), is the location. Its up quite a steep narrow hill, with cars badly parked both sides and dog mess at regular intervals. There is absolutely NOTHING easily accessible for papers, snacks or just a drink. You have to trek up and down the hill EVERY TIME!. All in all, this overrated complex (should only have ONE key) is best suited to youngsters who have lower standards and just want a place to change and get over the hangovers. Sunsea 2 apartments were a disgrace. They were past basic, the toilet and sink were dropping apart, the seating area was filthy and stained up, the furniture was rotting, the walls were stained with blood and god knows what else. The lift hardly ever worked and it was the only one, the pool area was a disgrace with cats round it all the time, there was 20 sun loungers to the hotel and most of them were broke. The hotel had trees round it with dirty underwear, dirty toilet roll and rubbish hanging from them that the cleaners could easily of moved from the balconies. We were only there 48 hours whilst we waited for a move we would not have stayed there for two weeks, we paid to be moved. Sunsea 2 is a dirty whole, unfit to stay in. I would not rate it 2 star. The brochure says suitable for groups, bear in mind this encourages groups of young people and they do go on holiday to party. We travelled here from Manchester expecting something really billy-basic but adequate. Upon arrival at the hotel we were blown away by the view as soon as we arrived. We were located on the upper floors so had a room with 3 balconies giving panoramic views all around the bay, two bedrooms and two bathrooms. It was very clean and well maintained. I have never stayed in somewhere so big for an apartment. Don't be put off by some of the other reviews - our stay was brilliant and I would recommend this to anyone. The only downside was lack of facilities at ground-floor level, but that was why it was a 2-key. Still on holiday whilst leaving this feedback. Hotel room very dirty with grime also bugs crawing around the floor. Returned back to the room after a afternoon out and found the room had been robbed. The receptionist didn't seem to be interested and seemed to think this is all part of going on holiday! Very dangerous on the stairs and around the pool area! Lifts are faulty and the doors are rusty to the extent they dont shut properly.